Take down your giant machines. When contaminants such as dirt particles enter lubrication zones, a chain reaction of wear and damage occurs. Damaged systems mean shorter equipment life, disrupted operations and increased maintenance- and that’s money out of your pocket. Understanding ISO cleanliness codes will help you calculate the potential life extension that can be achieved by moving from the current ISO cleanliness to a recommended ISO cleaniness level. 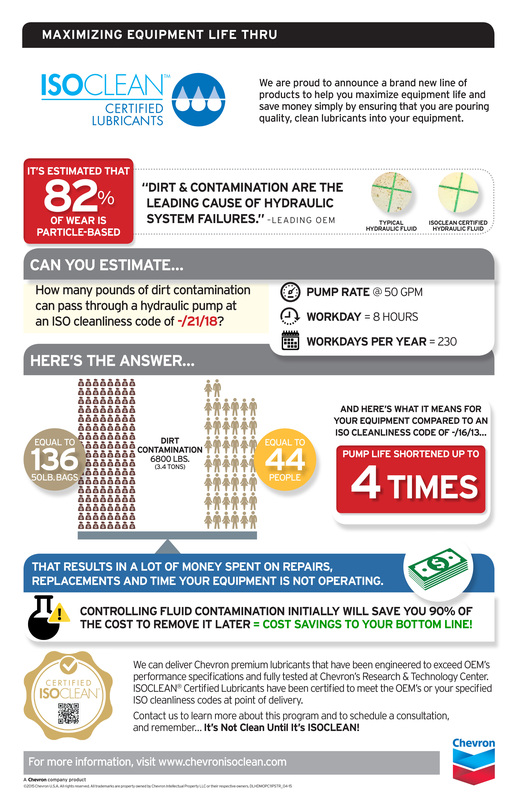 Chevron knows your equipment’s performance depends on the cleanliness of the fluid being used. 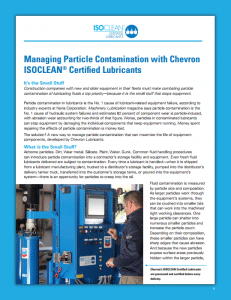 That’s why we offer lubricants filtered and delivered specifically to OEM’s ISO Cleanliness specifications. Every delivery of Chevron ISOCLEAN® Certified Lubricant has been lab-tested, certified and is backed by the Chevron brand so you can rest assured that your equipment’s performance will never be compromised. To learn more, download the PDF below. Equipment operating under normal temperature with lubricants kept free of solids, moisture and gases are likely to last significantly longer than equipment with contaminated lubricants. Equipment operating under normal temperature with fluid systems kept free of solids, moisture and gases are likely to last significantly longer than equipment with contaminated systems. ISOCLEAN Certified Lubricants offer consistent quality to help you maintain a clean system.